UNMC › Pharmacology › Faculty & Staff › Primary Faculty › Siddappa Byrareddy, Ph.D. Currently recruiting graduate students. Please contact if you are interested. Postdoctoral Research Associate and Research Technologist positions coming soon. Distinguished Scientist: Siddappa Byrareddy, Ph.D.
View comments from other journals, universities and news organizations. 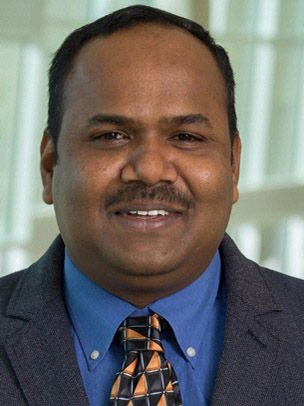 New faculty spotlight: Sid Byrareddy, Ph.D.
Our laboratory focuses on understanding host-virus dynamics using molecular biology, virology, immunology, systems biology, and genomic tools to develop prevention strategies for HIV/AIDS and other infectious diseases such as Zika virus. We use non-human primate models for most of the in vivo studies. Our long-term goal is to set up well-controlled clinical cohorts in tandem for testing the disease outcomes in relevant animal models as a synergistic platform for preclinical development of vaccines/therapeutics. Dynamics of host-virus interaction and development of biologically relevant primate models. Our research is focused on the generation of biologically relevant primate models using Transmitter/Founder viruses (T/F) env. We mostly focus on developing a non-human primate model to study HIV associated neurocognitive disorders (HAND) in relevant animal model in the era of cART. Furthermore, predominant route of HIV-1 infection occurs following sexual contact with vaginal transmission accounting for the majority of all newly acquired infections worldwide. Knowledge on how HIV disseminates within the genital mucosa following initial introduction and subsequent gradual spread to the lymphoid compartments as well as CNS is still elusive. We will address these questions systematically using biologically relevant primate models. To understand the role of Env Glycosylation in mucosal transmission/host virus interaction. Viral env glycosylation is thought to influence preferential transmission by selecting receptors for cellular entry and rendering its susceptibility to neutralizing antibodies. Our laboratory evaluates the role of env glycans using a set of HIV-1 clade C molecular clones predominantly obtained from transmitted/founder (T/F) viruses of a Zambian cohort. The overall goal of this research is to provide improved understanding of virus-host relationships that promote transmission and contribute to the rate of disease progression following infection, which are in turn critical for effective HIV vaccine design. Functional Cure of HIV. We are developing strategies aimed at limiting inflammation and improving immune responses in the gut as well as other lymphoid tissues. Our ultimate goal is to develop combinatorial therapeutic intervention strategies for antiretroviral therapy treatment. Mechanistic studies of NeuroAIDS/Drugs of abuse. We are using the SIV/macaque models to evaluate the brain as a viral reservoir in the setting of antiretroviral treatment. Although most reservoir work has concentrated mostly on CD4+ T cells, these are not the primary infected cells in the CNS, where long-lived macrophages and microglia take this role instead. Furthermore, drugs of abuse are frequently co-morbid with HIV-1 infection and further affects the CNS. We are studying the effects of drugs of abuse/immunotherapy on modulating the effectiveness of antiretroviral treatment by monitoring changes in cellular/immunological markers possibly impacting infection and tissue migration both in brain cells as well as in lymphoid cells. Zika Virus host-virus interactions. The Zika virus (ZIKV) is a newly emerging pathogen that has resulted in a worldwide epidemic. Our laboratory began working on this virus in late 2016 and developed several leads in order to understand the virus pathogenesis and development of therapeutics. We have demonstrated that intersecting polyamine catabolism pathways with polyamine analogues derivatives can inhibit ZIKV replication. As a result, we are currently investigating polyamine analogues as potential treatment to Zika. We also developed a macaque model for Zika infection in order to understand virus immune cell dynamics, glycosylation, and co-infection with other viruses, such as HIV, dengue virus. 1: Rothan HA, Fang S, Mahesh M, Byrareddy SN. Zika Virus and the Metabolism of Neuronal Cells. Mol Neurobiol. 2018 Jul 24. doi: 10.1007/s12035-018-1263-x. [Epub ahead of print] Review. PubMed PMID: 30043260. 2: Routhu NK, Xie Y, Dunworth M, Casero RA Jr, Oupicky D, Byrareddy SN. Polymeric Prodrugs Targeting Polyamine Metabolism Inhibit Zika Virus Replication. Mol Pharm. 2018 Aug 6. doi: 10.1021/acs.molpharmaceut.8b00068. [Epub ahead of print] PubMed PMID: 30040423. 3: Dutta D, Johnson S, Dalal A, Deymier MJ, Hunter E, Byrareddy SN. High throughput generation and characterization of replication-competent clade C transmitter-founder simian human immunodeficiency viruses. PLoS One. 2018 May 14;13(5):e0196942. doi: 10.1371/journal.pone.0196942. eCollection 2018. PubMed PMID: 29758076; PubMed Central PMCID: PMC5951672. 4: Dave RS, Jain P, Byrareddy SN. Follicular Dendritic Cells of Lymph Nodes as Human Immunodeficiency Virus/Simian Immunodeficiency Virus Reservoirs and Insights on Cervical Lymph Node. Front Immunol. 2018 Apr 19;9:805. doi: 10.3389/fimmu.2018.00805. eCollection 2018. Review. PubMed PMID: 29725333; PubMed Central PMCID: PMC5916958. 5: Gumber S, Amancha PK, Yen PJ, Villinger F, Gabuzda D, Byrareddy SN. In vivo characterization of macrophage-tropic simian immunodeficiency virus molecular clones in rhesus macaques. J Neurovirol. 2018 Mar 28. doi: 10.1007/s13365-018-0628-2. [Epub ahead of print] PubMed PMID: 29594984. 6: Santangelo PJ, Cicala C, Byrareddy SN, Ortiz KT, Little D, Lindsay KE, Gumber S, Hong JJ, Jelicic K, Rogers KA, Zurla C, Villinger F, Ansari AA, Fauci AS, Arthos J. Early treatment of SIV+ macaques with an α(4)β(7) mAb alters virus distribution and preserves CD4(+) T cells in later stages of infection. Mucosal Immunol. 2018 May;11(3):932-946. doi: 10.1038/mi.2017.112. Epub 2017 Dec 20. PubMed PMID: 29346349; PubMed Central PMCID: PMC5976508. 7: Byrareddy SN, Arthos J, Cicala C, Villinger F, Ortiz KT, Little D, Sidell N, Kane MA, Yu J, Jones JW, Santangelo PJ, Zurla C, McKinnon LR, Arnold KB, Woody CE, Walter L, Roos C, Noll A, Van Ryk D, Jelicic K, Cimbro R, Gumber S, Reid MD, Adsay V, Amancha PK, Mayne AE, Parslow TG, Fauci AS, Ansari AA. Sustained virologic control in SIV+ macaques after antiretroviral and α4β7 antibody therapy. Science. 2016 Oct 14;354(6309):197-202. PubMed PMID: 27738167; PubMed Central PMCID: PMC5405455. 8: Byrareddy SN, Kallam B, Arthos J, Cicala C, Nawaz F, Hiatt J, Kersh EN, McNicholl JM, Hanson D, Reimann KA, Brameier M, Walter L, Rogers K, Mayne AE, Dunbar P, Villinger T, Little D, Parslow TG, Santangelo PJ, Villinger F, Fauci AS, Ansari AA. Targeting α4β7 integrin reduces mucosal transmission of simian immunodeficiency virus and protects gut-associated lymphoid tissue from infection. Nat Med. 2014 Dec;20(12):1397-400. doi: 10.1038/nm.3715. Epub 2014 Nov 24. PubMed PMID: 25419708; PubMed Central PMCID: PMC4257865.